Zetsche: Daimler had a strong first quarter. FRANKFURT –- Daimler reported an unexpected increase in first-quarter earnings as the company delivered a record number of Mercedes-Benz cars. Earnings before interest and taxes rose 4.9 percent to 2.13 billion euros ($2.81 billion) from 2.03 billion euros a year ago, the company said on Friday. Revenue climbed 9.2 percent to 27 billion euros after the manufacturer reported record monthly car sales in March. Profit beat the 1.94 billion euro average estimate of eight analysts surveyed by Bloomberg. CEO Dieter Zetsche reiterated full-year goals of increasing sales and matching last year's 9 billion euro operating profit at continuing operations. 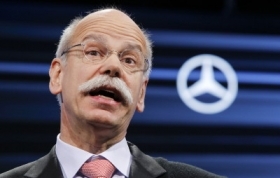 Zetsche, who also leads Mercedes, has repeatedly called 2012 a year of transition for reaching profitability targets set for 2013. "We have started the year with a strong first quarter, despite higher investment in future growth and a challenging market environment," Zetsche said in a statement, pointing to higher quarterly car sales, revenue, EBIT and net profit. Daimler's profit is "slightly better than expected, but more or less in line," said Albrecht Denninghoff, a Sylvia Quandt Research analyst in Frankfurt. "These results are not the great game-changer to convince skeptics." The margin at the Mercedes car brand, the metric most comparable with profitability at rivals BMW and Audi, slid about 90 basis points to 8.4 percent. Mercedes Cars, which includes both the Mercedes and Smart brands, has a goal of raising the operating margin to at least 10 percent of sales in 2013 from 9 percent last year. By comparison, Volkswagen reported on Wednesday that Audi's margin widened 80 basis points to 11.4 percent over the period. Daimler blamed a seasonal increase in inventories for having burned 2 billion euros in free cash at its industrial operations over the first three months of this year, reducing its cash pile to 10.1 billion at the end of March. "Higher levels of stocks are related to the start of the peak selling season in spring at Mercedes-Benz Cars and the market launch of new products such as the B class, the SL and the SUVs," it said. By the end of the decade, Daimler wants to recapture its leading position among the luxury-carmakers, pursuing the same goal as the Audi brand. BMW, which overtook Mercedes in global luxury-vehicle sales in 2005, will release quarterly earnings on May 3. "I don't think Daimler can attain that target, because the others won't lessen their efforts," said Juergen Pieper, a Bankhaus Metzler analyst in Frankfurt. Audi, which currently ranks second to BMW after beating Mercedes in deliveries last year, boosted first-quarter operating profit by 27 percent to 1.41 billion euros, parent company Volkswagen said on Thursday. Mercedes plans to put 10 completely new models on the market by 2015 to rejuvenate the brand, including converting the A-class compact into a sportier car. The brand has a target by that year of delivering 1.6 million vehicles, a figure BMW surpassed in 2011 with its namesake marque and British subsidiary Mini combined. First-quarter deliveries by the Mercedes brand rose 12 percent to a record 313,902 cars and SUVs. The unit is targeting growth of more than 4 percent for 2012 for a second consecutive annual record. Daimler opened a 800 million euro Mercedes car factory in late March in Kecskemet, Hungary, where it's making the van-like B-class model. Workers at the site, Daimler's first new assembly plant in 15 years, earn one-fifth of their counterparts' pay at Rastatt, Germany, the other location where Mercedes makes the B class.